Learning a new language is a wonderful thing – it helps us to travel, to grow and to communicate with people from all around the world. But it can be difficult and expensive too. Luckily, with a Rosetta Stone promo code you can make great savings on online language courses. Whether you want to brush up on your Spanish or learn Mandarin from scratch, Rosetta Stone offers can help you expand your knowledge for less. Founded in 1992, Rosetta Stone produces innovative software that helps children and adult learn a foreign language. Whether you're looking for something to assist your child with GCSE languages, something to help you learn a conversational language for travel and holidays or an adult learner looking to proceed to an advanced level, Rosetta Stone's tried and tested methods can help you learn whatever language you choose in record time. At the time of their launch Rosetta Stone were pioneers in using interactive software to accelerate language learning, and today offer courses in 24 languages from around the world. The name Rosetta Stone refers to the famous stone tablet from 196BC that was inscribed with three different languages and provided the key to the modern understanding of Egyptian hieroglyphs – and the software company is becoming just as famous in its own right for helping customers all around the world make sense of and master foreign languages. Their technology-led approach to language learning is used by thousands of schools, businesses and government organisations, as well as millions of individuals worldwide. Customers can use Rosetta Stone software to learn some of the world's most spoken languages such as English, Spanish and Mandarin, or to get to grips with some less prominent languages like Tagalog, Polish and Russian. Rosetta Stone software has its roots in the notion that learning a language should be natural and instinctive, and that learning through immersion is a far more effective method than learning in a traditional classroom environment. It uses technology to mimic the ways in which the brain naturally acquires a language through a combination of pictures, sounds and text. The software activates your brain's natural capacity to learn and leads to excellent results in a surprisingly short period of time. With a sound philosophy behind it and millions of success stories to support its effectiveness, Rosetta Stone is the number 1 choice for language learners around the world. Want to get learning with Rosetta Stone? With a Rosetta Stone promo code you can enjoy great discounts on a choice of packages covering 24 languages. Whether you want to brush up on your Spanish for your next holiday or learn advanced Japanese for business, Rosetta Stone offers will help you achieve your goals without breaking the bank. Browse our website until you find a Rosetta Stone promo code that's right for you, then navigate to their website to begin shopping. Choose a language to browse the available packages, then click 'Add to basket' to buy. Choose instant download or CD-ROM and click 'Proceed'. Choose a payment plan and click 'Proceed to checkout'. Enter your Rosetta Stone promo code where applicable. Want to find out more about the fascinating world of Rosetta Stone? Why not check out their dedicated YouTube channel? You'll find lots of exclusive content including links to Rosetta Stone commmunities around the world, featurettes on language learning, course reviews and overviews and more. 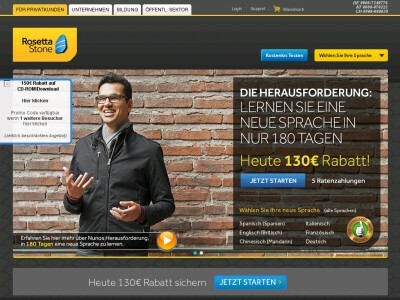 You can also use this channel to find out more about saving money with Rosetta Stone offers. If you enjoy learning with Rosetta Stone, you might want to browse foreign language books at Amazon or perhaps test yourself with a foreign film at Cineworld. Or, if these don't inspire you, you'll find plenty of similar stores in our Books, Music, Games and Music section. Enter your details and payment information and click 'Review your order'. If you choose the CD-ROM option, standard delivery is free within the UK. If for any reason you are not happy with your product, Rosetta Stone operates a 30-day money back guarantee. Need to contact the team at Rosetta Stone? Whether you have a question about your order, want to learn more about how the language learning system works or you just want to find out about saving money with Rosetta Stone offers, you can contact the customer services department by telephoning 0800 085 3492. Want to find out more about what's happening behind the scenes at Rosetta Stone? Why not follow the company across all your favourite social media platforms? You'll find lots of exclusive content including daily quizzes and tests in a variety of languages, competitions, Rosetta Stone offers and more. You can also use these pages to find out more about saving money with a Rosetta Stone promo code. Don’t forget to check them regularly, as you can never be sure when a free Rosetta Stone promo code might be waiting for you! Want to learn a language on the go? With the official Rosetta Stone app you can use your subscription on your mobile device to practice words and phrases wherever you are. Buy now online at www.rosettastone.com. When my brother got a job in Spain, he needed to learn the language fast – but all the courses were so expensive. Luckily, I discovered he could make big savings with a Rosetta Stone promo code. Rosetta Stone offers a range of language courses, including some suitable for complete beginners, in a choice of languages. Thanks to his Rosetta Stone promo code, he was able to get his Spanish skills up to scratch in no time. We just logged on to rosettastone.co.uk, entered the Rosetta Stone promo code and enjoyed great savings straight away!